Nominations for the 2017 Awards closed in April and an independent judging panel selected the finalists and winners. 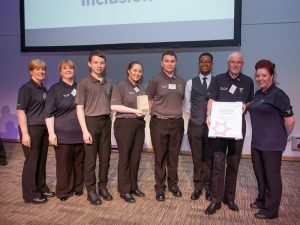 We celebrated the work of all nine finalists on 1st June at an event at the Glasgow Royal Concert Hall. The Awards were part of our #VolunteersWeekScot celebrations and the stories of each of the finalists provide examples of how organisations can expand their opportunities for people to support their work and how to make them more inclusive. You can view the story of the 2017 Awards night below with reactions, comments, and interviews with nominees and others attending.